Circuit: #380Energy Harvesting using a Current Transformer __ Circuit designed by David A. Johnson, P.E. Energy harvesting is all the rage these days. With some modern electronics, information from low power sensors can be sent to a distant data collection point using a low power RF transmitter. To power these remote sensors, various energy sources can be tapped into. Machine vibration, temperature differences, ambient light and stray RF have all been used as low power energy sources. Sometimes, the sensors are located near AC power cables. 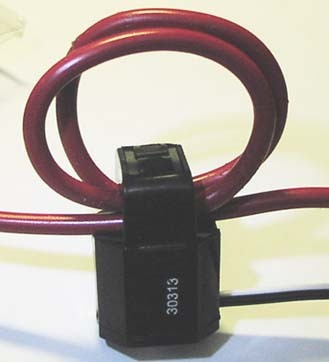 Rather than making a direct connection to those cables, an AC current transformer, such as the one shown below, can be used to capture a bit of power. The CR3110-3000 current transformer is one example of a useful energy-harvesting device. 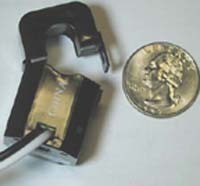 It is a fairly small device and can easily be snapped onto a thick cable. Its center hole measures about 0.4 inches. It has a high turns ratio, so even with a low AC current, the device can produce a useful voltage. The circuit shown below is an example of converting the AC from these devices into DC. The circuit is a classic voltage-doubler, using two efficient schottky diodes. With 1 Amp of AC current flowing through a single wire in the center of the transformer, a voltage of 3v DC with an 86uA load can be produced. The circuit tracks a square law function so with 2 Amps of current through the center wire, 360uA of DC current can be generated. With 4 Amps nearly 800uA of DC current can be collected. To increase the power collected you can also wrap more than one turn through the center hole. Although the part is small there is room enough for 3 turns around a heavy 10 gage insulated wire as the photograph shows.